Chicken pot pie is one of my absolute favorite comfort foods. I could eat it every day. Whenever I go out to a restaurant, if chicken pot pie is on the menu you can bet I am going to order it. So, I decided to try my hand at making this classic chicken dish in my slow cooker. And it came out fantastic! 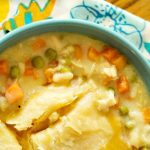 There is a bit of work involved in this recipe as you need to start the process for the thick chicken gravy on the stove top and then let it and the chicken and vegetables cook in the slow cooker and then, add a pie crust to the top of the chicken pot pot pie and let that cook. 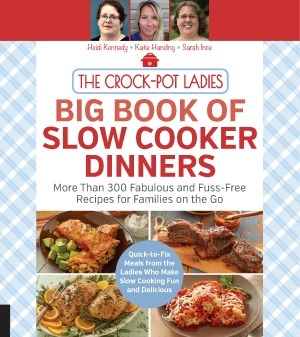 But the results are great and everyone in the family won’t believe that you made chicken pot pie in your CROCK-POT! 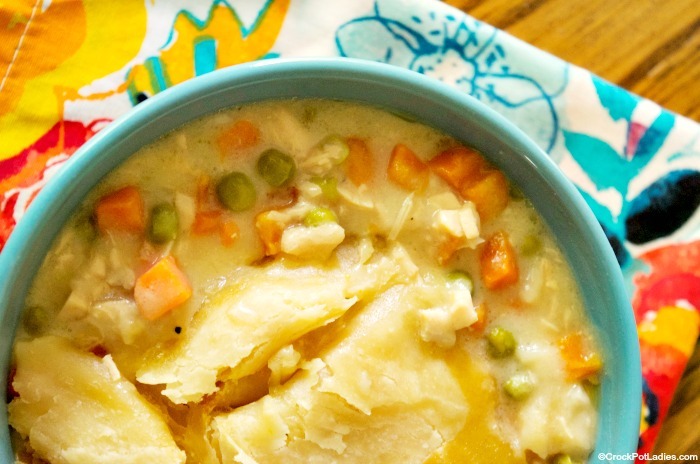 The perfect comfort food, this chicken pot pie is all cooked in the slow cooker. Even the crust that goes on top of the pie! Heat a medium skillet over medium--high heat on the stove top until hot. Add the butter, onion and garlic to the pan. Saute onion and garlic in butter for about 3 minutes until the onion becomes translucent. Add flour to the pan and cook and stir until the butter has mostly absorbed into the flour. Add mixture to a 5 to 6 quart slow cooker. Add milk and chicken stock to slow cooker and stir well to combine. Add chicken pieces, peas, carrots, poultry seasoning, salt and pepper to slow cooker and stir. 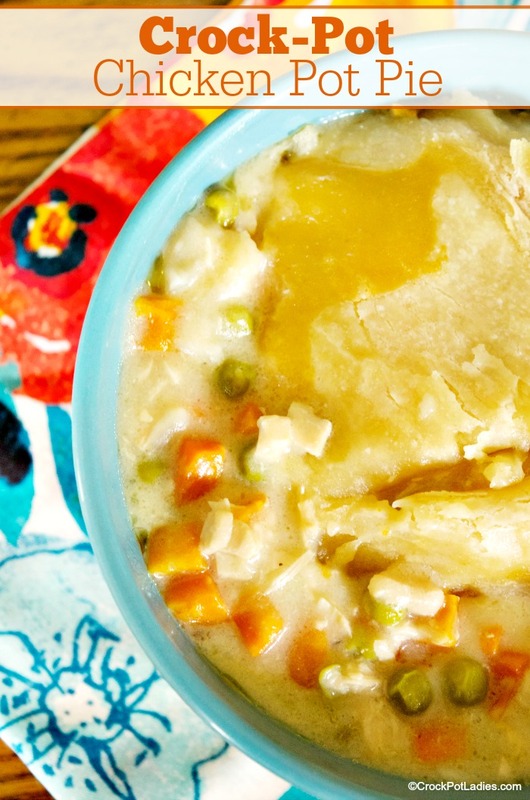 Unroll refrigerated pie crust and place it on top of the chicken mixture in slow cooker in a single layer. If you are using an oval shaped slow cooker you may want to slightly stretch the pie crust dough out to fit the slow cooker better. Place a clean kitchen towel or layer of paper towels between the lid of the slow cooker and crock. Continue to cook for 1 to 1 1/2 hours on LOW until the pie crust is cooked through. I tried to make the Chicken pot pie in the crock pot. The ingedients were Super and tasted great, but pie crust was nothing but mass of glue like gunt.. please tell me how you got your crust brown? I am sorry that it didnt turn out. When I first made this, I really didnt think the crust would amount to much. I put one layer of crust (premade in the roll pillsbury pie crust) on top of the mixture in the crock-pot. Put the lid on and let it cook. I checked it periodically to see where it was at and then after an hour, the top was crusty. I would like to know also. how you get your crust brown. also you said priory to serving, don’t understand. do you bake it first? Sorry about the recipe being confusing. I did go back and correct that. I cooked the pie mixture for 6 hours. I then unrolled the pre-made pie crust and put one layer on top of the mixture in the crock-pot. Put the lid back on and continued to cook on low. I didnt think it would turn out the way I wanted but wanted to try it out. After an hour, The top of my crust was crusty and brown. That is when I spooned it out. Thanks, that makes sense. Did not see the corretion for cooking time so i will Definately try it again !!! We have not tried this recipe with dough on the top and bottom, nor have we used biscuit dough. If you try it let us know how it turns out! My husband made this recipe as listed (cooking the chicken mixture first and ready made pie crust on top the last hour.) First off, the chicken mixture was incredibly bland and had not thickened in the least after 6 hours. It needed 2 hits of corn starch, and was still too watery. The pie crust was a total bomb. After one hour it was rubbery, so we made slits for some steam to escape and cook the top. After more than an hour and 20 minutes, it was still pasty and only partially cooked. Pretty disgusting. I just made this – with a few changes – and loved it! I added green beans and previously-cooked and shredded frozen chicken. I did mix in a little cornstarch just because of comments. When the mixture was cooked, I transfered it to a casserole dish and covered with homemade pie crust and baked it. So good! I made this tonight! It was delicious! I used crescent rolls on top just cause I didn’t have a pie crust. I put them on top for half an hour in the crockpot, then browned them in the oven for 9 minutes. I would definitely make this again! Thanks for the great recipe! So glad you enjoyed this recipe Chesnye! The addition of crescent rolls sounds fabulous! Can this be made,starting with uncooked chicken or will that make it have too much liquid? hmmmm…I am sure it can be done with raw chicken. I would go raw not frozen. It might end up being a little too liquidy at the end, if so maybe just a little flour to thicken it…just a little otherwise it will taste too much like “flour”. Love this recipe. I made a few changes. I cook it on high for 3 hours then add instant potato buds to thicken it up a bit. Last, I pour the mixture into a glass baking dish and top with crescent rolls bake at 375 for 30 min or until top is golden brown. It’s to die for. Potato Buds that would make it tasty!! thanks for the update on how you did it. I use potato buds as a gluten free alternative to whatever I cook as a thickener. Normally, I process my gf bread crusts or ends to make crumbs which would make a great topping for this casserole. I am guessing that how this recipe turns out depends on your crock pot. How old/new it is, how big and so on. I have several – you just have to experiment. So I am making this recipe now and it didn’t say cooked chicken so I assumed raw, it it very soupy. I am going to try instant potatoes and put in casserole dish for last hour. Is the nutritional info for the whole dish or single portion? I just want to be sure. Tasted great. After reading the comments I did add a couple of tablespoons of cornstarch to thicken the liquid. I used a thick dish towel between the pie crust and the lid of my slow cooker and my crust came out great. I also used a casserol slow cooker . So glad you enjoyed the recipe Toni.